For hockey fans in the Czech Republic, Saturday is a busy day. In particular, for the cities of Prague and Ostrava, which each host two big games. Of Prague's two Extraliga clubs, one is long gone and the other is waiting to begin its semifinal series on Monday. However, the Junior Extraliga counterparts of those clubs are at home on Saturday, hosting big playoff games. Thursday in Junior Extraliga playoff action. Photo: hcorli.cz. At 16:00, Slavia Praha hosts Oceláři Třinec at Zimní stadion Eden, and they can advance to the semifinals with a win Saturday or on Sunday. The series opened Thursday in Třinec, where Slavia won 4-3 in overtime, with Michal Barák scoring the winning goal with 24 seconds to play in the period. The biggest surprise was the presence of Dmitrij Jaškin in Slavia's lineup, after he had played game 7 in Liberec for Slavia's pro team the night before. He scored a goal and added 2 assists. Presumably, Jaškin will be in the lineup again at home Saturday, before re-joining the pro club in Třinec on Monday, so hockey fans in Prague who want a chance to see the possible first-round NHL draft pick in action for free should head to Eden. At 19:00, Sparta Praha hosts Benzina Litvínov at Tesla Arena. Top-ranked Sparta can also earn a spot in the semifinals with a win, thanks to a 4-1 road victory on Thursday. Like Slavia, Sparta's lineup was bolstered by the presence of a pro. David Tůma, who played in the World Junior Championships in Buffalo, NY, played in the game, though he recorded no points. Sparta was led by 2 goals from Daniel Přibyl, both assisted by Tomáš Rubeš. For real hockey junkies in Prague, there are a variety of public transportation options that could take a fan from Kubánské náměstí to Výstaviště (tram stops for the respective arenas) in 35 to 40 minutes. Check jizdnirady.idnes.cz/praha/spojeni for details. Slavia and Sparta weren't the only junior clubs that received reinforcements from the big league. Dalibor Řežniček and Petr Holík, both WJC participants and regulars in the professional Extraliga, skated for PSG Zlín's junior squad and contributed to their 3-1 victory in Znojmo. 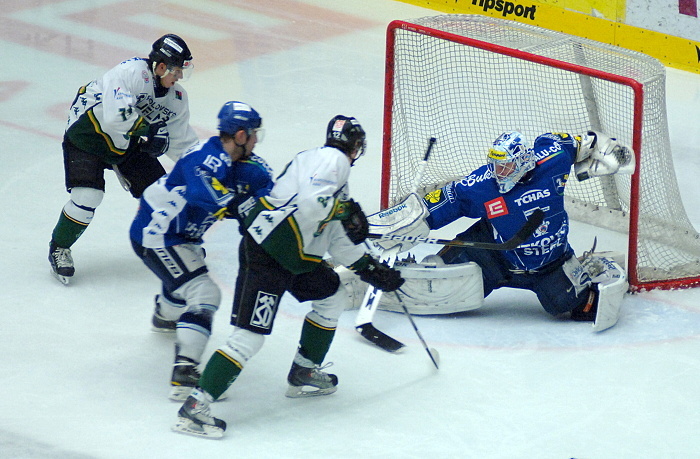 Řežniček assisted on a goal by Holík in the last minute of the first period. The addition of these two players greatly improves fourth-ranked Zlín's chances, and makes them a serious contender for the junior national championship. Saturday's game gets underway at 12:30. Ostrava's ČEZ Arena will be the site of two playoff games on Saturday. At 13:00, the junior Vítkovice Steel club will host Energie Karlovy Vary. Unlike the other three teams that are hosting Junior Extraliga quarterfinal games on Saturday, Vítkovice dropped its first game, so it will be looking to even the series on home ice. Martin Rohan led Karlovy Vary with 2 goals. Hockey fans in Ostrava don't have to worry about transportation. Later on Saturday, ČEZ Arena will host the main event, as the professional Extraliga's semifinals get underway. Vítkovice hosts Eaton Pardubice at 17:00. The game can be viewed live online at www.ct24.cz/sport or tv.hokej.cz, but the television broadcast on ČT4 Sport will be tape-delayed until 19:30, following the AC Sparta Praha-FC Zbrojovka Brno football match. Game 2 will be televised live on Sunday at 18:10.